Oliver here. It’s pawty time again and I’m hosting this one. When #TheTribeOfFive was deciding which blog post of ours to feature, I stretched out and contemplated for quite a while. I finally decided that we wanted to highlight our “Let’s Talk About Adoption” post, even though it was for Remember Me Thursday on Sept. 28. Pet adoption is a big deal in our house (all five of us are rescues) and besides, you get to see the awesome kitten pictures of each of us (and a tribute to Miss P. and Buster who crossed over the Rainbow Bridge). But enough about us, here are my three picks from the last party, enjoy and please join us in the Linky Party Festivities, all species of pets are welcome! I always love to read about the goings on in Erin’s regal residence and this story had me enthralled. Seems Erin found herself on the high seas with quite a cast of characters. This is what happens when you take International Talk Like a Pirate Day too seriously! 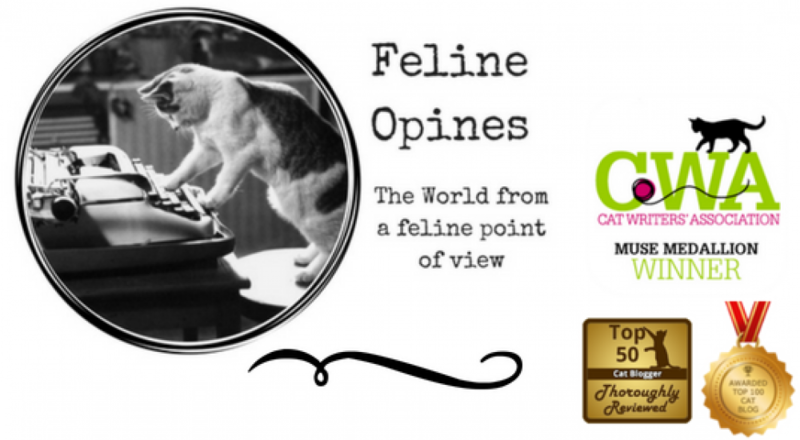 We love the felines at this wonderful blog. They took the time to send love and condolences to our friends at Animal Shelter Volunteer Life on the loss of their beloved fur kid Zoe. The Tribe of Five sends our love and prayers as well. Say hello to Miss P. and Buster Zoe! I love to read the updates from the female felines at this blog. Dolly is one pretty kitty and the two sisters here at the Tribe of Five are thinking a “Sister Saturday” would be a good idea on our blog as the brothers seem to take over the blog writing! This entry was posted in adopting kittens, animal shelters, blog hop, Cat adoptions, cat behavior, Cat blogs, cats, kittens, linky party and tagged cat adoption, Feline Opines, linky party, Remember Me Thursday by Feline Opines. Bookmark the permalink. Oliver, that’s got to be my favorite picture of you … you OWN that window sill! Thank you, the male human has titled it, “I’ve fallen and I can’t get up” Hah, hah, funny human. Improving on perfection just can’t be done, and they are both perfect in their own ways though maybe the real you has it by a whisker MOL. Looking forward to having my human read me more about your pirate adventures!